The system design printout includes a precipitation chart that lists the total inches (mm) of water applied for different speed settings on the central control panel. Runoff from center pivot irrigation can be controlled by changing the optional speed control setting to adapt the precipitation rate to the soil infiltration rate. Agronomic methods of controlling runoff include furrow diking, farming in a circular pattern, deep chiseling of clay sub-soils, maintaining crop residue on the ground, adding organic matter and using tillage practices that leave the soil “open”. Farming in circles is one of the best methods of controlling runoff and improving water distribution. When crops are planted in a circle, the pivot never dumps all the water in a few furrows as it can when irrigating parallel straight rows. Circle farming begins by marking the circular path of the pivot wheels as they make a revolution without water. The tower tire tracks are then used as a guide for laying out rows and planting. If the mainline span length does not accommodate an even number of grop rows, adjust the guide marker so that the tower wheels travel between crop rows. Furrow diking is a mechanical tillage operation that places mounds of soil at selected intervals across the furrow between crop rows to form small water storage basins. Rainfall or irrigation water is trapped and stored in the basins until it soaks into the soil, rather than running off. Maximum crop production and quality are achieved when crops are irrigated frequently with amounts that make up for the water lost through plant use or evapotranspiration. Irrigating twice weekly with center pivots is common. 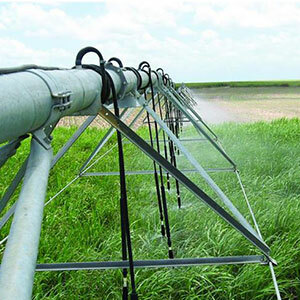 One strategy used by growers is to add up the accumulated daily crop water use (evapotranspiration) reported during the previous 3 to 4 days and the set the pivot central control panel to apply that amount of water. Growers with insufficient irrigation capacity should use a highly efficient water management strategy, which ensures that the soil root zone remains filled with water, either by rainfall, pre-watering or early-season irrigation, before the daily crop water use exceeds the irrigation capacity. Soil moisture monitoring is highly recommended and complements evapotranspiration-based scheduling, particularly when there is rainfall during the irrigation season. Soil moisture monitoring devices such as tensiometers and watermark and gypsum block sensors can identify the soil moisture content, monitor any changes, locate the depth of water penetration and indicate crop rooting depths. These three types of sensors absorb and lose moisture similar to the surrounding soil. One response to "Pivot management"
I like that you mentioned that irrigating twice a week with the central pivots is a common number. My father-in-law has a farm so I’ve been super intrigued with everything he does. I didn’t realize the technology behind irrigating crops and the thought that goes into it. I’m excited to keep learning about them and maybe even help out on the farm sometime soon!